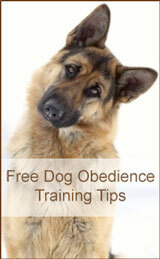 Large breed dogs, particularly German Shepherds, are susceptible to dog hip dysplasia. Hip Dysplasia in German Shepherds is a common degenerative joint disease caused by an an abnormal formation of the hip joint. The hip consists of a ball and socket joint. The femur head is the ball and should fit nicely into the socket which is called the acetabulum. If there is not a snug fit, the joint is abnormal. 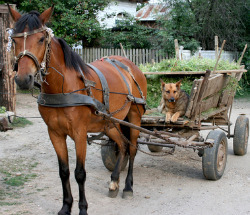 No two dogs will experience hip dysplasia in the same fashion. There are infinite variations, ranging from very slight looseness to complete dislocation. 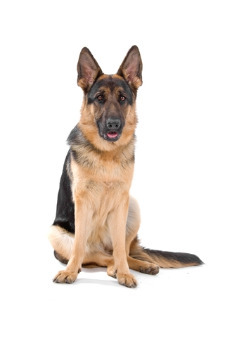 What Causes Hip Dysplasia in German Shepherds? If either parent has hip dysplasia or carries the genes for it, than it is likely to be passed on to their offspring. Yet another great reason to avoid backyard breeders. 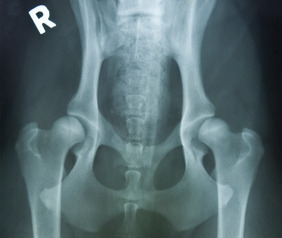 German Shepherd hip dysplasia signs may become evident between 5 and 8 months. But, some dogs will not show any signs until they are mature adults. A young dog may run with its back legs in sync, almost like a bunny hop. Decreased range of motion may be noticed as the pup will be unable to extend their leg backward very far. The pup will hesitate to jump and will not want to "stand up" on its rear legs. After exercise, the puppy will be reluctant to get up and may sit back as if unsteady. While standing, the rear legs may not appear parallel, and they may have a "cow hocked" look where the ankles stand too close together. You may notice a slight underdevelopment or boniness in the rump area. This is from a lack of good muscle development. Please note that the "lazy sit" with knees extended out to either side is actually a good sign and not an indication of hip dysplasia. Severely dysplastic dogs will attempt to support more weight on their front legs by rocking forward. This can create issues in the elbows and shoulder. They may appear to be tippy toeing and walking lightly on their hind legs. The only way to know for sure if your dog has hip dysplasia is to have it x-rayed. This is typically done under anesthesia. While sedated, the dog is completely relaxed and it allows the vet to manipulate the hips to feel any degree of looseness. OFA will not certify a dog under 2 years of age, while a PennHIP evaluation can be done as early as 4 months. There are surgeries available ranging from bone excision to total hip replacement. They can be expensive, but some have shown good results. Good nutrition and reasonable exercise is also very important to keep your dog from becoming overweight. Excess weight will put more stress on their hips. One tip I learned is to lay a ladder down flat and make her walk through it. By forcing her to pick up her legs, it will help develop muscle tone where it is needed in the rump. Arthro-Ionx is a natural treatment specifically designed for hip dysplasia and arthritis in dogs. This homeopathic liquid can simply be poured into your dog's water bowl. I tried this remedy and saw a difference within just a few days. The company that makes it guarantees results in 60 days. There are also supplements you can use that are good for joint health that will keep the cartilage from breaking down. They are glucosamine, chondroitin and MSM. Nutri-Vet Hip & Joint Plus contains all of these beneficial ingredients in a tasty, chewable tablet to support your dog's hip health. Do not patronize any breeder that cannot prove a lineage of good or excellent hips. Both parents and grandparents should have been certified for excellent hip conformation. It is best to look at 3 to 4 prior generations to ensure that the bloodline is free from carriers of CHD. Canine Hip Dysplasia is a disease that can be eliminated. But only if we all demand strict requirements for certified hips.